It is very important to keep a good posture while your working with a computer. Understand about the concept of neutral body positioning will help you to set up your computer work station in a best way. This concept will help you to maintain a good and comfortable working posture, this makes your joints in to natural and proper alignment. Neutral positioning will reduce the stress and strain on your muscles, tendons and skeletal system, also reduces the risk of developing a musculoskeletal disorder (MSD). In some situations you might need the help of an orthopedic specialist. Here we have listed some important key points when trying to maintain neutral body postures while working with computer. Keep your hands, wrists and forearms straight, inline and roughly parallel to the floor. Your head position should be above screen level or bent slightly forward, forward facing, and balanced. Generally it is in-line with the torso. Shoulders should be relaxed and hang upper arms normally at the sides of body. Keep elbows close to the body and bent between 90 and 120 degrees. Give a complete support to the feet by the floor or foot rest. 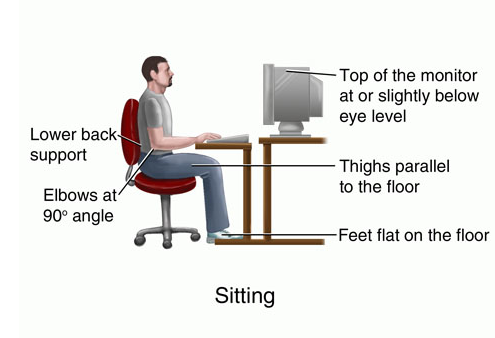 Use chairs with a good back support with appropriate lumbar support when sitting vertical or leaning back slightly. working in the same posture or sitting still for a long interval of time may cause health disorders, so change your working posture frequently throughout the day in the following ways. Make some adjustments to your chair or backrest. Stretch your arms, hands, fingers and torso.